In a bowl, combine the lemon zest, kosher salt, ground black pepper, minced garlic, dried parsley, dried thyme, and extra virgin olive oil. Set aside. Remove the giblets from inside the cavity of the chicken. Rinse both the inside and outside of the chicken under cold water and pull out any remaining pin feathers from the skin. Pat dry with paper towels, and place the chicken on a large rimmed baking sheet. 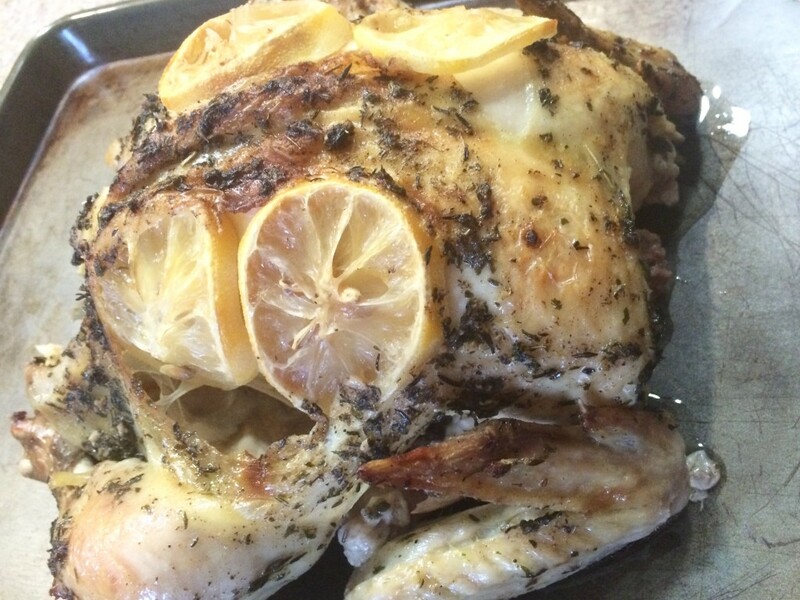 With the chicken breast-side up, gently slide the lemon slices between the skin and the breasts of the chicken. Brush the oil/herb mixture over the entire outside of the chicken, and put the onion quarters in the cavity. Place breast-side up in a roasting pan containing about 1-inch of water. Cover and roast chicken for about 20 minutes per pound, until the internal temperature reaches 165 degrees.